The White Cliffs of Dover now have a philosopher-in-residence to ponder why they are so important to the British. 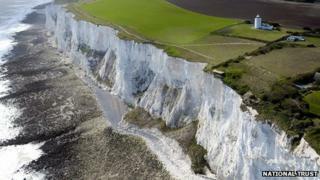 But what and who helped the chalk cliffs become such a symbol of the nation? For many people the White Cliffs of Dover are a clear symbol of Britain in the way the Statue of Liberty defines America for many. They are made up of billions of the crushed shells of tiny sea creatures. So much so, the National Trust has appointed a philosopher-in-residence to explore their importance to the nation. It owns a five-mile (8km) stretch of the famous Kent coastline and is fundraising to buy more. Julian Baggini will spend a time at the chalk cliffs writing and blogging about them. "The white cliffs of Dover have a very special place in the collective imagination, even for those who have never seen them," he says. Irreversibly linked to World War II in many people's minds and Dame Vera Lynn, they are repeatedly voted one of Britain's best-loved sights. But what and who else helped them become so important to Britons? Before Dame Vera Lynn raised the profile of the cliffs, Julius Caesar did the job. He wrote about them in the Commentarii De Bello Gallico, Commentaries on the Gallic War, said to be the earliest surviving eye-witness account of Britain. In the account, Caesar's first impression of Britain was of "a wild island with giant natural fortification", according to historian Dan Snow. In 55BC he arrived with two legions of soldiers looking for a good place to disembark. Instead he faced the towering cliffs and "armed forces of the enemy" on them. They were able to hurl weapons down on the soldiers, forcing Caesar up the coast so his army could land on a more open beach, says Snow. And so the cliffs and their significance went on record. Caesar saw the cliffs as a fortress and something that impeded his invasion, says the National Trust's Virginia Portman. "The cliffs are still seen as offering the nation some sort of protectiveness, a barrier to those who are unwanted," she says. The Bard famously brought the cliffs to the attention of the nation in the play King Lear. So much so, one of the cliffs is named after him. "There is a cliff, whose high and bending head looks fearfully in the confined deep: Bring me to the very brim of it, and I'll repair the misery thou dost bear... "
It's a crucial scene and no coincidence that the White Cliffs of Dover were chosen as the setting. "The scene is very famous," says Dr Stephen Purcell, who teaches English and Comparative Literary Studies at Warwick University. "It is in this scene that Shakespeare takes the play beyond the normal generic boundaries of tragedy and make it a different kind of play, so tragic it's funny. "The cliffs are used in the play to symbolise a boundary, one between the known and the unknown. That's what the cliffs represent to many, a boundary between land and sea, high and low, between Britain and the outside." The cliffs have formed the backdrop to countless important moments in British history, including where Charles II stepped ashore as king after years in exile. Charles landed at Dover in May, 1660, having sailed from the Hague on a ship decked out in finery. He was rowed to the beach and with the white cliffs looming over him, stepped back on to British soil. He is said to have been greeted by a cheering crowd, many standing on the cliffs, and a cannon being fired from Dover Castle. It was the natural spot for him to return as Dover was the place where royalty would welcome overseas visitors. Enlarged over the years, Dover Castle became known as "the key to England". "Dover was a key place for royalty," says Gareth Wiltshire, the White Cliffs of Dover Visitor Experience manager. "Overseas visitors would be greeted there and the castle would provide accommodation. It would have been the natural place for his return. "The cliffs are a symbol the British identify with because they stand immovable. "Just as they provide a barrier to the outside world, they also provide a link because you can see France." They are in the first eye-witness account of Britain that has survived, written by Caesar, but the cliffs have been the location for many other firsts which have fixed them in people's minds. They are the site of the first electric lighthouse in the world, where Guglielmo Marconi made his first ever international radio transmission. South Foreland Lighthouse was built in 1843 to guide ships through the dangerous offshore banks of the Goodwin Sands. It was also used by Marconi for his work with radiowaves and is where he received the first international radio transmission from Wimereux, France, in 1899. The cliffs may even have given the country its earliest name. It is thought Albion may be derived from the Latin albus, which means white, although there is another possible etymology in a Proto-Indo-European word for "hill". "They are also the first place where the sun rises in the UK in winter," says Wiltshire. "This makes them the first place in the UK to greet the New Year." They have witnessed some of the most dramatic moments in English history, including the return of British forces rescued from Dunkirk in WWII. But while linked with war and invasions, the cliffs have become a symbol of peace for many people. "There'll be love and laughter, and peace ever after, tomorrow, when the world is free..."
For many returning soldiers they were the first thing they saw, says historian John Guy. "It represents being home and being safe and the peace they can bring." The whiteness of the cliffs also hold significance as the colour is associated with innocence and peace, says Wiltshire.